There are different development scenarios in which we use procedures(.hdbprocedure) or the system generates a procedure for. e.g. 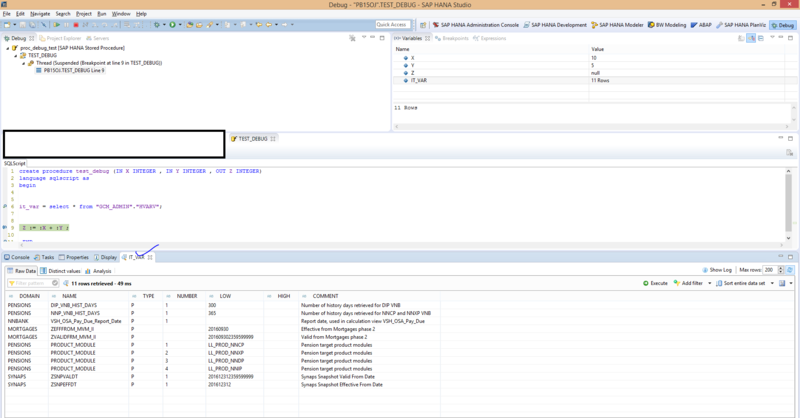 the use of HANA expert script based transformation creates a procedure inside the generated AMDP class. 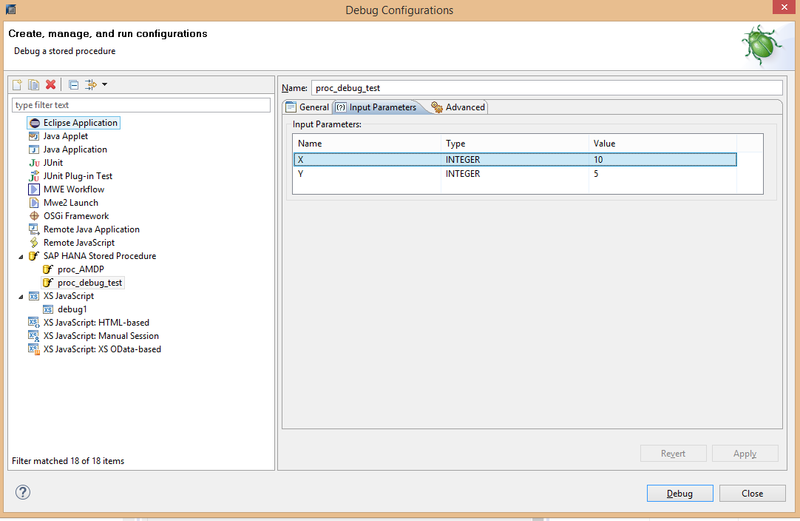 This blog series details on how to debug various procedures. The script based calculation views can also be de-bugged by using the wrapper procedure that is created in the schema “_SYS_BIC” by the system. The method to de-bug these objects remains the same as de-bugging any native procedure, which will be explained in the later sections of this blog. Additionally there are a lot of scenarios in which the system generates wrapper procedures for e.g. Decision Table. Some versions of HANA would require a XS project to be created for the de-bugging to work. The “Debug” perspective should be switched on. 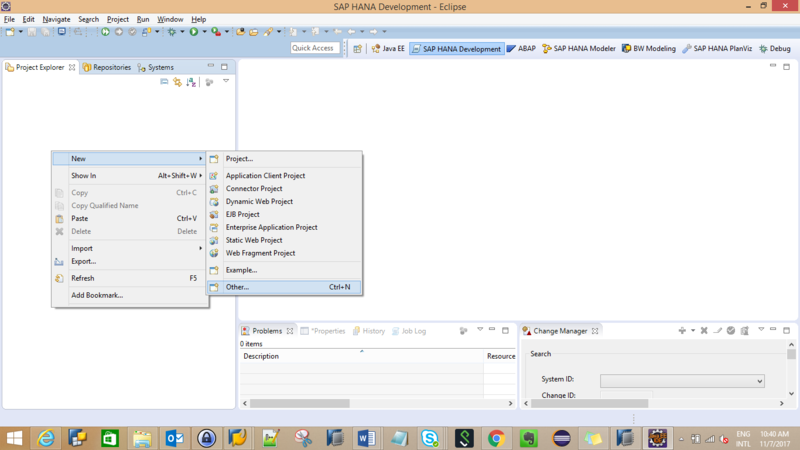 Step1: Switch to the HANA Development Perspective and go to the Project explorer view. 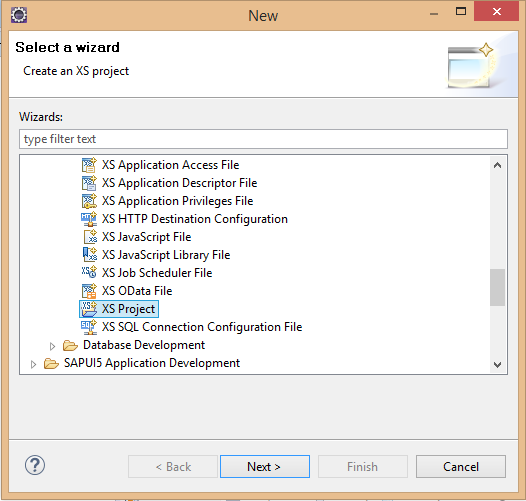 Step 3: In the Select Wizard, please chose XS project. 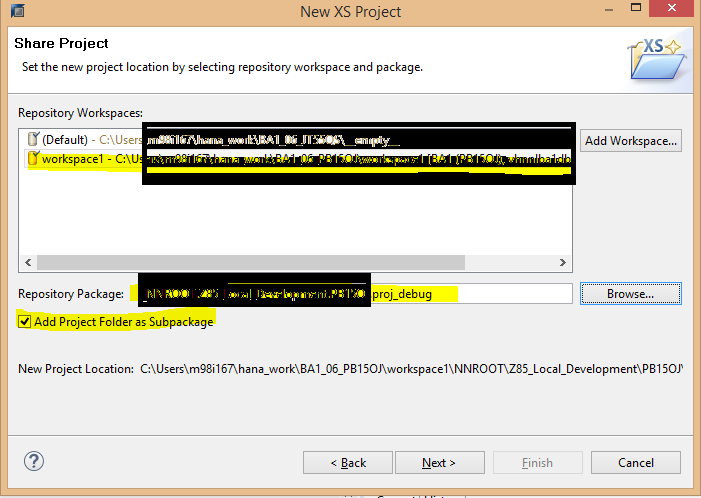 Step4: Fill in the relevant details , select the workspace and the repository package in which the native content has to be created. 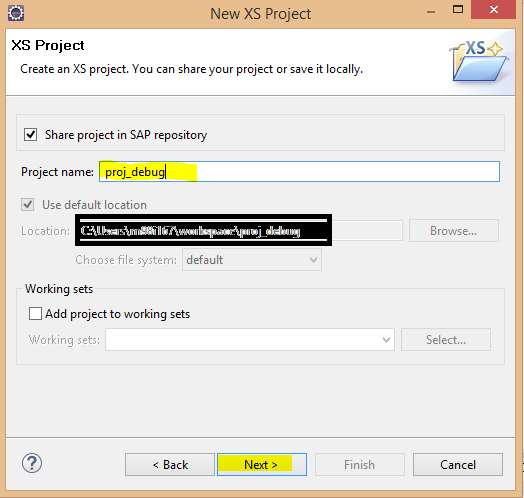 The XS Project is ready and is now visible in the project explorer view. The below are the mandatory privileges required for the DEBUG user on the schema , where the procedures are stored. For e.g. 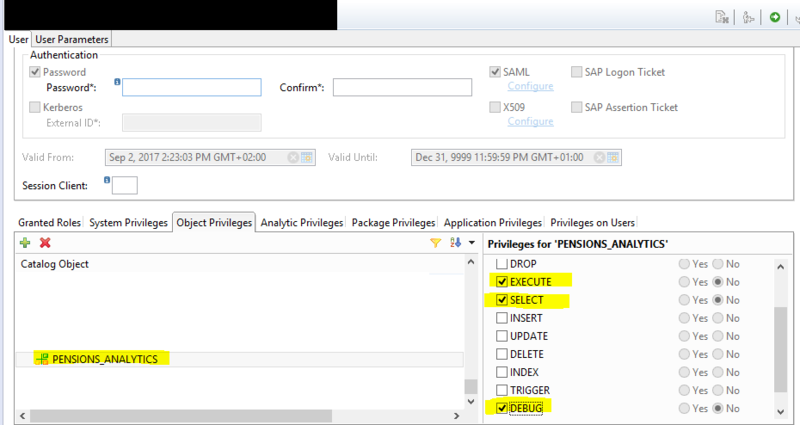 If the DEBUG user is ‘USER01’ and the Schema in which the procedures are present is ‘PENSIONS_ANALYTICS’. 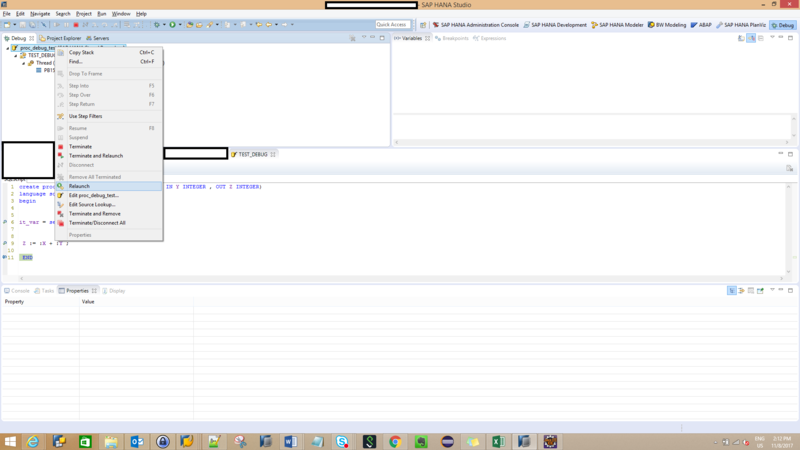 The Debug perspective can be switched on selecting the path as below in eclipse. If it doesn’t show up , please select Other and select Debug in the dialog. The Debug perspective opens up as below. Now we are all set to start De-bugging the procedures. 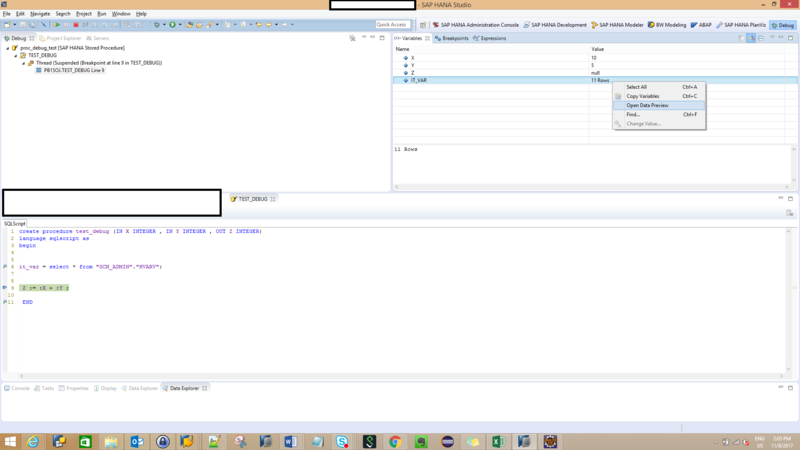 For this scenario I will be using the procedure “TEST_DEBUG” present in the schema “USER01”. The definition of the procedure is as below. Then we have an addition operation performed on X and Y and stored in Variable Z (line 9). 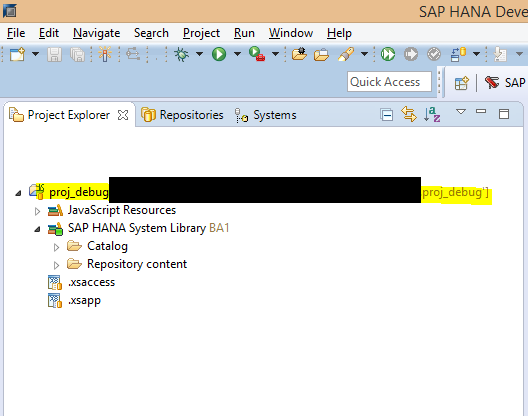 Step 1: Go to the XS project “proc_debug” from the Project explorer view. 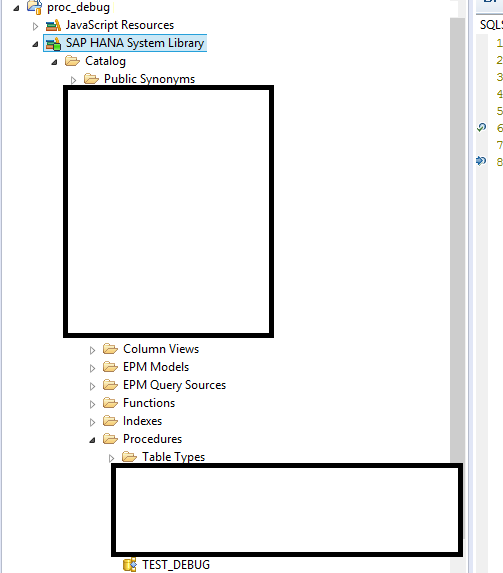 Step 2: Drop down the catalog from the SAP HANA System Library and point to the Schema and procedure. 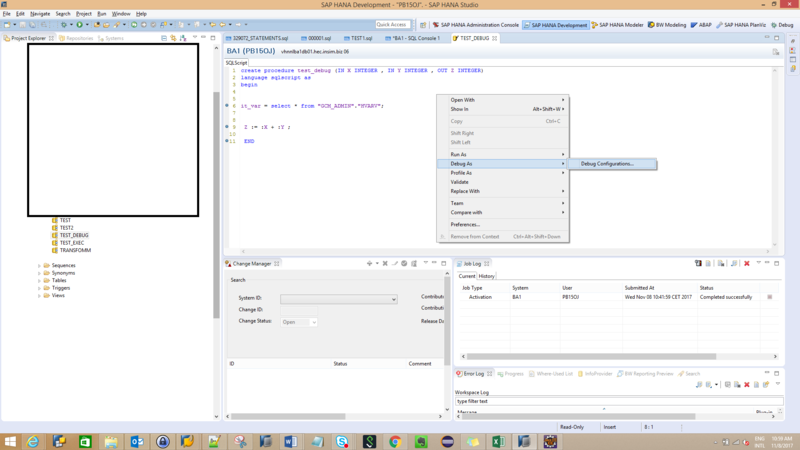 Step 3: Go to the context menu of the procedure, which you want to de-bug and choose “Open with SAP HANA Stored Procedure Viewer” and set the break-points at lines 6,9 and 11 by double-clicking. 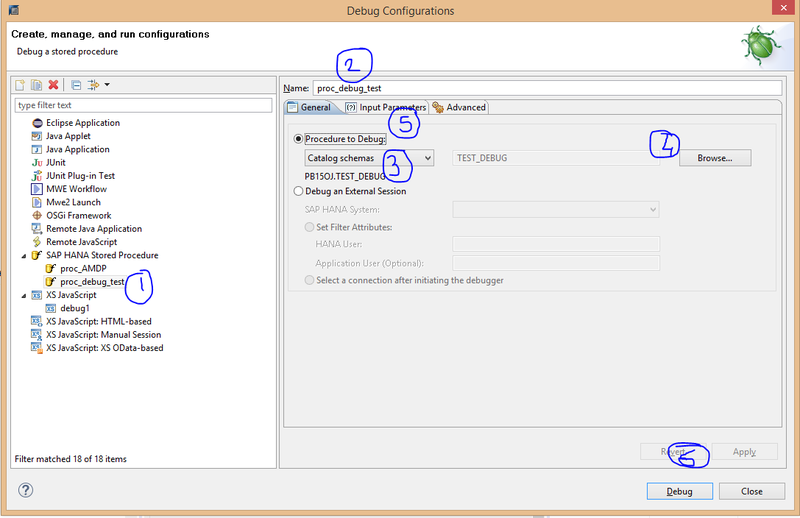 Step 5: The Debug configurations menu pops up , please create a new debug configuration “proc_debug_test” and from the General tab , select “Catalog Schemas” and browse for the procedure “TEST_DEBUG”. Step 6: Click on the tab “Input Parameters” to see the input parameters based on the procedure definition are read-out. We can give values to these input parameters. In this example, I have given 10 for X and 5 for Y. Step 7: Click on “Debug” and open the “Debug” perspective . The screen below shows up. The Debugging thread is by default suspended at the first Break-point at line 6. 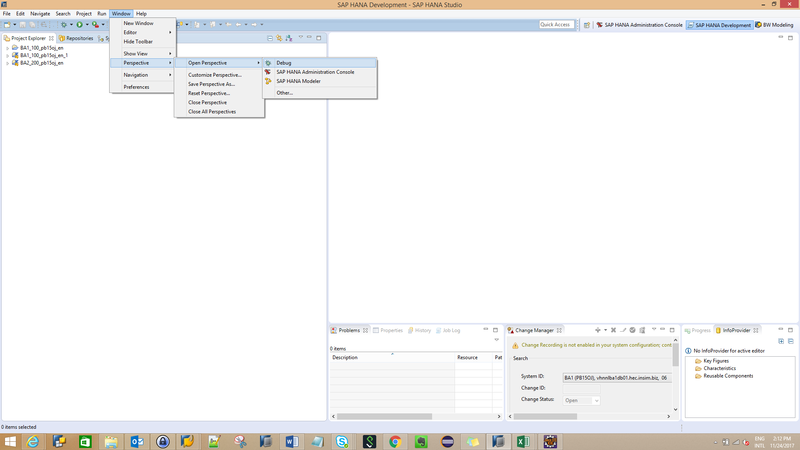 In the pane on right, we can see the Variables filled with values. Now the output parameter of the procedure Z is also visible and the value is ‘Null’( as the control is at the first break point –line 6). You can see the list of active break-points from the Breakpoints tab. Step 8: For the control execution to go to the next break-point, please press F8. Now you can see the control is at line 9 and the intermediate variable “IT_VAR” is shown in the variable list and contains 11 rows. Step 9: To view the contents of the variable “IT_VAR” , please right click on the variable and select “Open Data Preview”. Step 10: The content is displayed in the bottom pane in the Data Explorer view. Step 11: Press F8 to go to the next break-point at line 11, which is also the end of the procedure. The debugging is suspended at line 11 as it is the end of the procedure and there are no more break-points and the variable Z is now filled with 15. 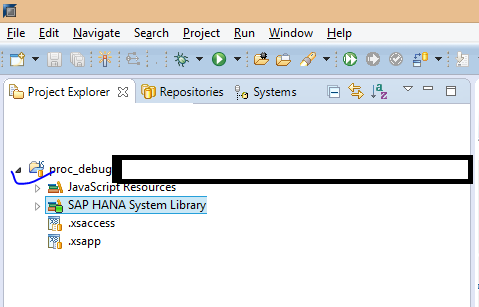 Step 9: If we want to re-start the debug session , please right-click on the Debug configuration and select “Relaunch”. 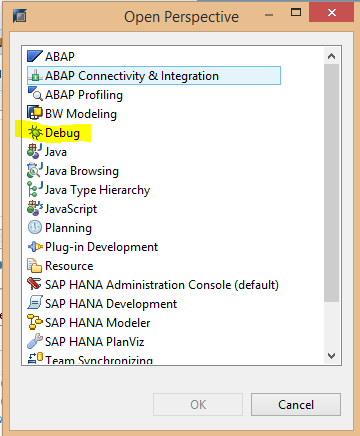 That concludes the part-1 of the blog series on Debugging various procedures in HANA, in the next part i will explain on how to de-bug the HANA expert script transformation in BW 7.4.